Remember that time I stayed up really, really late writing a post that, apparently, never got posted? 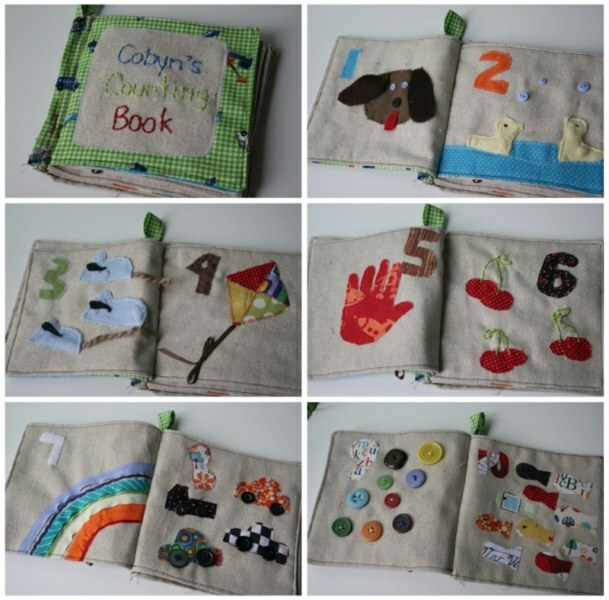 Here’s Cobyn’s counting book. The puppy was a new idea and considering the cute fuzzy ears and floppy tongue I think he’ll be making a reappearance in future books.I used some of my favourite standard pages #3, 4, 5, and 7. Then I borrowed from Nate’s book for pages 8 and 10.I copied Mya’s book for page 6 and 2. 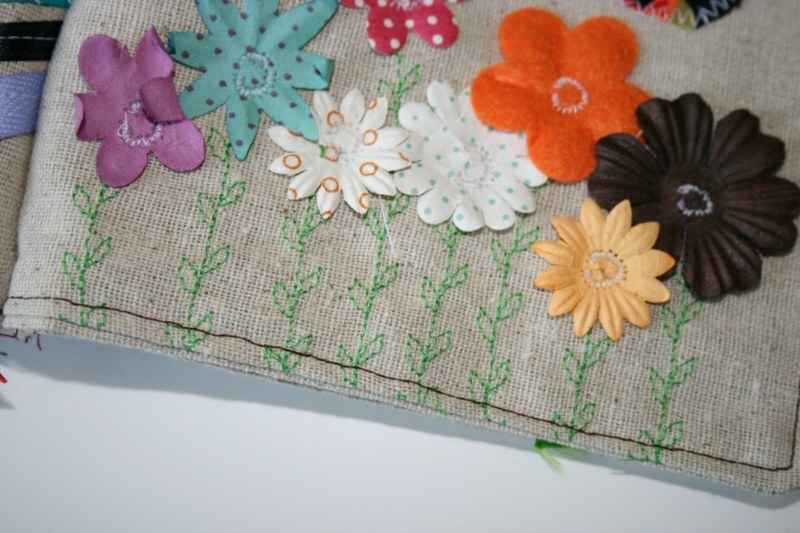 Here’s Cassie’s book from waaay back, just for some extra handmade goodness for your eyes. My cup cozy is in the ‘procrastinate’ position. Weeeeell, maybe it hasn’t been all procrastinate I have been busy with my shop but that was only since July. Remember my counting books? I posted about them in . . . months ago. A big part of the problem was running out of osenburg, which I have only found at Joann’s craft stores so that means a cross boarder trip. When I went in September I bough 10 yards of it. I should be good for a while. Last night I buckled down and finished one for someone. She asked for 2 of them so I’m hoping to get the other one done this weekend. And spidey senses must have been tingling in my area because just randomly 2 other friends asked where the books are for their babies. So I’ve got a little To Do list for this weekend and those counting books are on it! Along with a few other things of course. 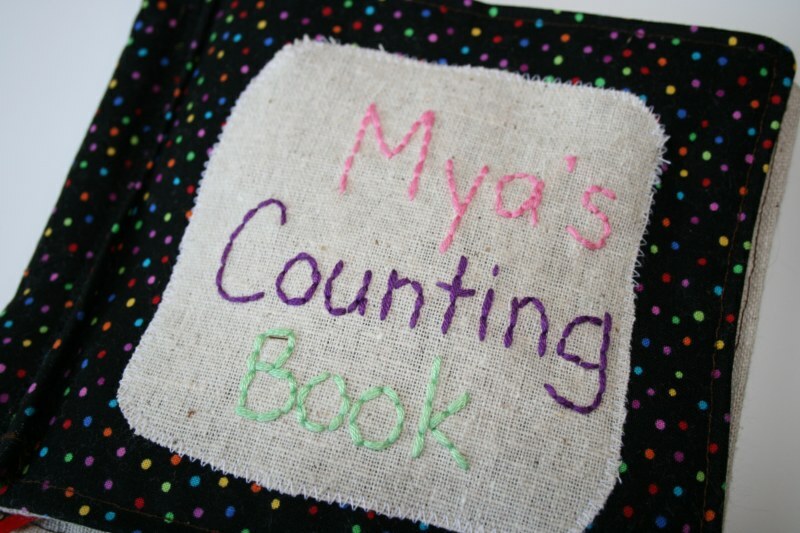 Here are some shots of Mya’s counting book. I finished it at about 11:30 but wasn’t happy with the size of the first few pages, somehow the pages were getting bigger at towards the back. So I did some stitch ripping and re-sewing until the wee hours. Thanks to my fancy pants new to me sewing machine I was able to add some fun, and time saving touches. 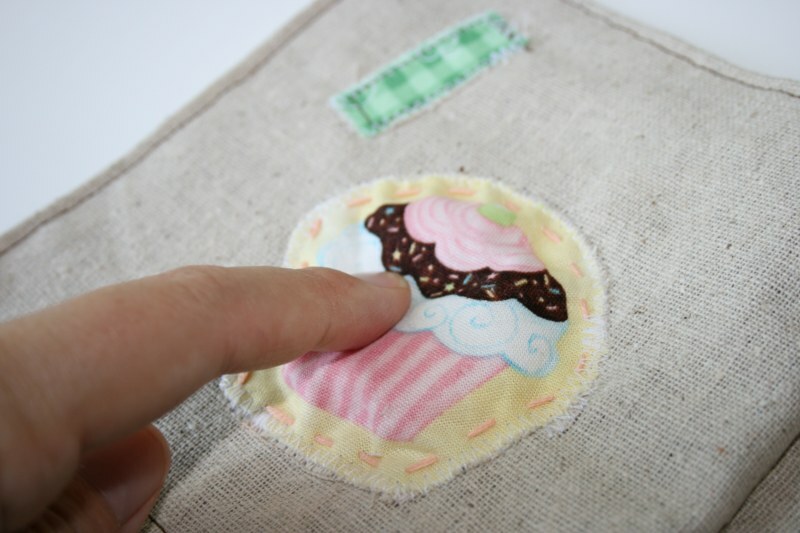 I also got creative with the tactile side of things and put this fun stuffed cupcake on the first page. 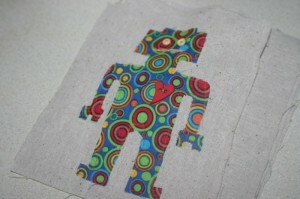 Finished off with my lovely labels, which are iron on but I sewed them as well because I like that look. Juice totes and my son’s counting book in progress . . . . finally. Although it feels like I haven’t been very crafty lately somehow I’ve managed to create things. 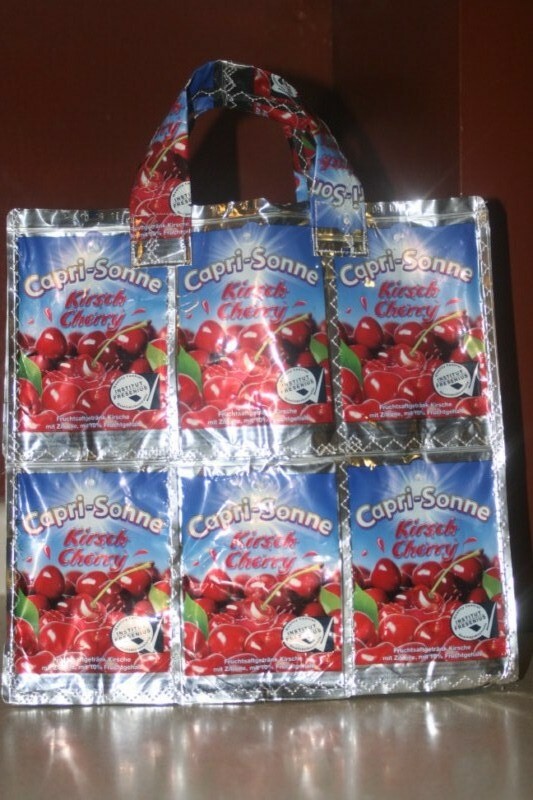 I finally assembled my German juice pouches, from Spain, into a cute little tote that I now use as my work bag. If work is at a school is it a ‘school bag’? When I came upstairs with it my husband said, ‘Oh cool, are you going to sell that one?’. 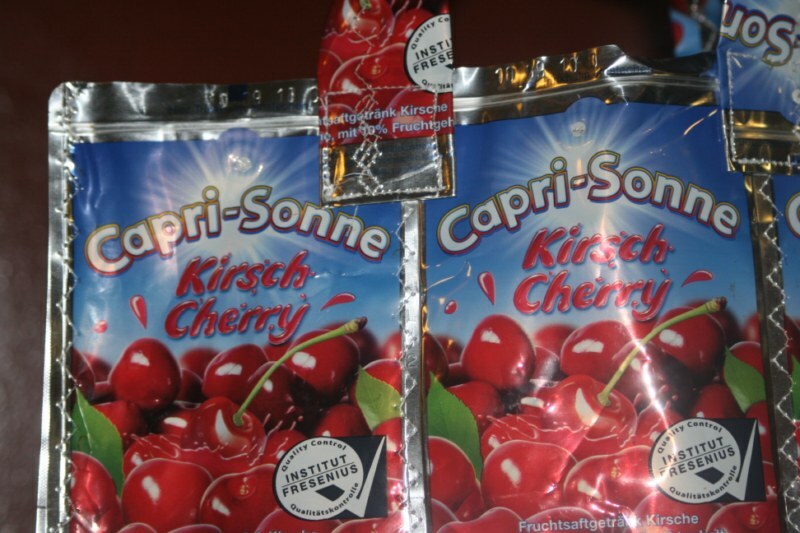 I nearly died, after all that drinking and saving and trying to explain with gestures to the maid at the resort the pouches weren’t garbage . . . AND packing them to fly to England and then back to Canada! No way. This bag is mine! Plus they say ‘kirsch’! How cool is that? I’m going to visit my cousin tomorrow for the night, I’m packing the cover and some pages for Nate’s counting book. Some embroidery is needed so perhaps I can get that done while the gaggle of our 5 children play. Here’s a shot of the #1 page, there’s a robot on it. I’m taking her daughters some crayon cozies gone wrong, I cut them a tad too short and they only hold 15 crayons instead of 16. They’ll still like them and I figured rather than waste fabric I’d make them anyway. 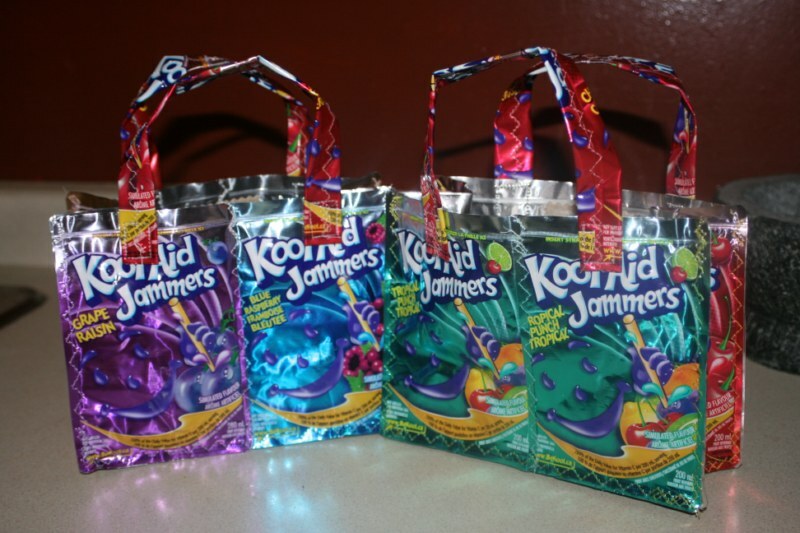 I also made them some little juice pouch totes as well. Lately some of students in my class have been bringing them for lunch so the lunch lady has been saving them for me.